Nicole, from Girl In a Boy House recently blogged about the inevitability of holiday events if you have children enrolled in any kind of extracurricular activity, apparently even karate in her case. Given that June is in four activities at the moment (due to a three-week overlap between the end of gymnastics and the beginning of basketball), I suppose we’re lucky we weren’t more overscheduled this month than we were. She did make a Christmas ornament in Brownies on Tuesday, but we didn’t have to bring food or show up for anything extra for that or for either of her athletic activities. However, last week, in various combinations, we did attend and the kids participated in three concerts over the course of six days. June’s music school had a recital on Sunday evening, Noah had a band concert on Thursday evening, and June’s school held its annual holiday concert/sing-along on Friday morning. These events were not all holiday-centric, but there was at least of touch of seasonal festivity in each of them. The recital was packed. They had divided it into two recitals and asked people who were originally scheduled for the afternoon one to switch to the evening one to spread the students out more evenly. 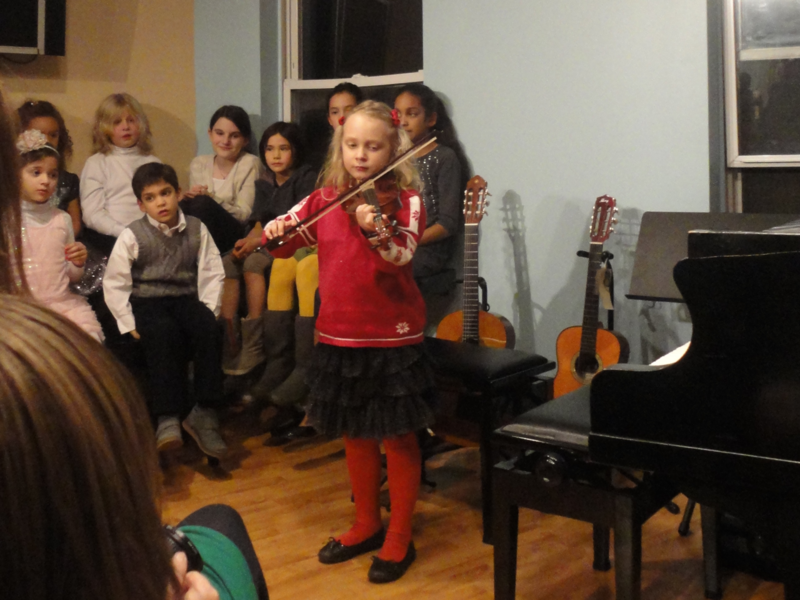 We were among the people who switched and I don’t know if too many of us did or if the afternoon recital was even more crowded, but in either case, the music school, which has open less than two years, is clearly doing a good business. It was standing room only and quite warm in the main front room. When we arrived, June called out to Toby, a friend of hers from school, and I waved to the mother of two sisters who attended her preschool, one before her and one after. Most of the musicians were either pianists or violinists, though there was at least one child playing the guitar. There were some of the standards you usually hear from beginning musicians like “Twinkle, Twinkle” and “Ode to Joy,” as well as more complicated classical pieces like “Fur Elise” and a Debussy piece from teenagers. Only two students chose Christmas music, but June was one of them. For weeks before the recital she played “Jingle Bells” and nothing but “Jingle Bells,” even when I tried to get her to practice some of her other songs. She experimented with different tempos and added her own flourish to the end. I knew she was more than ready by the big day. June played toward the middle of the program. They seem to group the kids roughly by experience, with tiny children climbing up onto the piano bench first and teachers giving guest performances last. When June’s piece was announced, I heard a preschooler in the audience cry out “Oh!” as in “Finally, a song I know!” She did very well and seemed pleased with her performance. The concert as a whole was quite enjoyable, especially toward the end. The last five students were just fantastic and it’s always fun to see the teachers perform, too. One of them had substituted for June’s teacher while she was on vacation, so we knew him. He played a very difficult sounding piece with a lot of vibrato. On the way to the car I told June she might play that well some day if she sticks with violin. She’s been playing almost a year and a half, but she’s been wavering about whether or not to continue since the summer. She always wants to try new activities and she gets tired of practicing. So, we’ll see. Thursday night found us in the gym at Noah’s school, which was a surprise because concerts have always been in the cafeteria up to now. The gym’s a little bigger, which might be the reason. There were enough people there that they had to find extra folding chairs and set them up during intermission. There was a bake sale, to which Beth contributed homemade pizzelles, and from which we bought a bag of assorted cookies, a cupcake, and peanut butter fudge. Noah had a long wait to play because the jazz ensemble, the intermediate orchestra, the chorus, and the intermediate band all performed before intermission and then after intermission it was the advanced orchestra and the chorus again before the advanced band. This concert was somewhat more Christmassy than June’s recital. For one thing, the band teacher and a few of the students were wearing Santa hats. 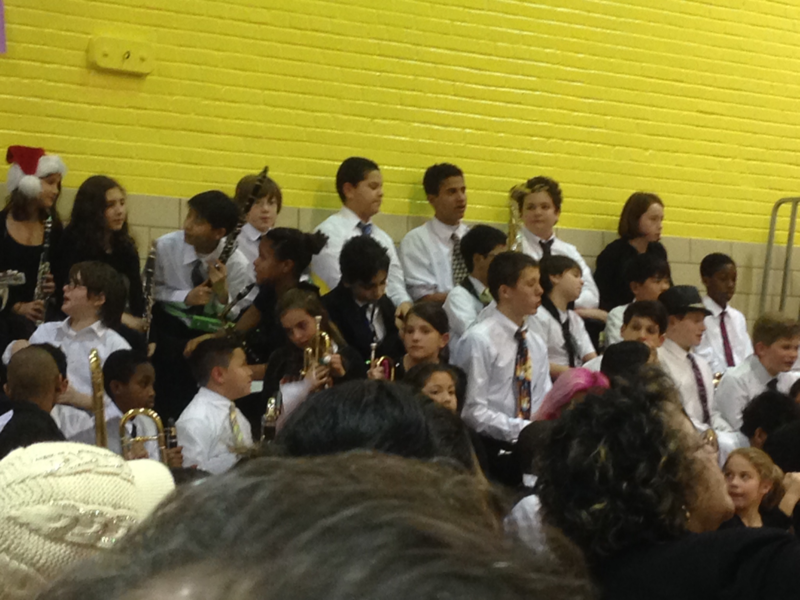 The jazz ensemble played “I Saw Mommy Kissing Santa Claus” as people took their seats. And the chorus’s second set was all Christmas and Hanukkah songs, including “Jingle Bell Rock.” It just wouldn’t be a school concert in December without “Jingle Bell Rock,” would it? There was a lot of popular music of my youth (and earlier) as well—James Brown’s “I Got You, I Feel Good,” “Eleanor Rigby,” and medleys of Queen and Journey songs. I suppose my kids will have to wait until their kids are playing in elementary and middle school concerts to hear the popular music of their day arranged for orchestra and band. In case you were interested in the musical preferences of parents at Noah’s school, the most enthusiastic reception was definitely for the James Brown. Now you know. When the advanced band performed Noah played tambourine, triangle, and claves. He was a little disappointed not to have a drum or bell part, especially as he’s been practicing the Journey medley a lot, but two of the songs had quite a bit of tambourine. In one song he was supposed to play two notes on the triangle and he missed one. “I missed fifty percent of the notes!” he said on the way to the car, but he seemed more amused than upset. It reminded me how frustrated he used to get about musical mistakes when he was younger and how he just takes them in stride now. Music has taught him that. It’s a good lesson. Noah had to stay after the concert to take the percussion instruments back to the band room so Beth and I made ourselves useful folding up chairs and stacking them against the wall for the custodians. It was 9:20 by the time we left the school and Noah still had homework, and Beth and I stayed up to make sure he wasn’t up half the night, so we were all up well past our respective bedtimes—except June who was already in bed asleep when we got home. As a result, I was tired the next morning as I walked to June’s school for the Holiday Sing. Tired, but cheerful, because I really like the Holiday Sing. I never miss it. At the bus stop that morning there had been a lot of confusion about whether or not the band and orchestra or just the orchestra was playing at this event. In a strange coincidence, most of the kids at our stop are in the fourth grade and nearly all of them play an instrument so there was a lot of consultation between parents. No clear answer emerged. I could see more than one band mother wonder if she should just take her kid’s instrument back home and not risk having her child lose it at school on a day it wasn’t supposed to be there, or if she would thereby deny her child the chance to play at one of the school’s big musical events of the year. In the end all the kids with band instruments took them on the bus. The way the Holiday Sing works is fourth and fifth graders who play instruments or are in the chorus perform for the whole school in shifts, and after each performance there’s a sing-along with the audience. The whole school practices the sing-along songs (some with hand motions) ahead of time in music class so all the kids know them. Some years the third graders play recorders but they skipped that this year. June is managing her disappointment. There were three shifts this year instead of the usual two, presumably due to the growing school population. (There are over nine hundred kids at June’s school. The whole third grade is in trailers.) This performance was for the second and third grade, so the chorus and the orchestra (but not the band, at least not at the 9:15 performance) were onstage facing the audience and the second and third graders sat on the floor of the cafeteria facing them. Parents were in the back on folding chairs. June’s class was on the floor pretty close to me, so I could watch her fingers mimic falling snow and other hand motions during one of the Hanukkah songs. That was a nice treat. Because the performers were closer in age to June than they’ve been in years past, I recognized a lot of them. A girl who used to play on her basketball team was playing cello, as was a boy from the bus stop, and several of her bus stop companions were in the chorus. One in particular looked like he was having a really good time and looked quite dashing in a Santa hat. The whole thing was very efficiently run. Four orchestra songs, three chorus songs, and nine sing-along songs, and we were out of there in forty-five minutes. I think the music department at Noah’s school could learn something from this event. A two-hour concert on a school night, no matter how lovely the music and talented the performers, is a bit trying. And we learned via email the very next day that they are thinking of breaking it up into two concerts in the future. I think it’s a good idea but either way next December I’m hoping to be in the audience again for another music school recital, for a high school band concert (in a real auditorium with comfortable seats), and watching June in a fourth grade chorus, orchestra, or perhaps both. I love watching them play, whenever and wherever they do. This entry was posted in Extracurricular Activities, Holidays, School by Steph. Bookmark the permalink.